Republic is certified as a Gardner Denver factory authorized repair and warranty center for all Gardner Denver PD blower lines. 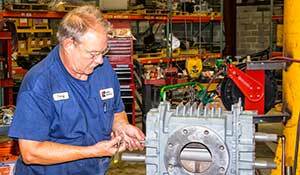 Republic technicians have over 50 years combined service repairing blowers and related equipment. Our technicians receive continuous factory training. Blowers repaired at Republic are returned to original performance specifications and carry added warranties. An in-house machine shop ensures that critical parts are brought back to original factory specs. Our large parts warehouse assures quick turn around times for critical repairs. Positive displacement gear and vane pumps, vacuum pumps, airlocks, compressors, and other process equipment are all serviced at Republic.